How about an ice cream which is cold inside and super hot outside on this rainy season?? Yes you got me right it's "Fried Ice Cream". The thing with opposite combinations tastes very unique like a hot Gulab Jamun in an ice cream or a ice cream on a hot cake. Mangalore being a place famous for the ice creams, there is a hotel by name "Cherry Square" and it was indeed very famous for the desserts they served. They served a dessert called "Some Like it Hot!" where cold ice cream scoop is placed on hot chocolate cake with hot chocolate sauce on it. It was heavenly! 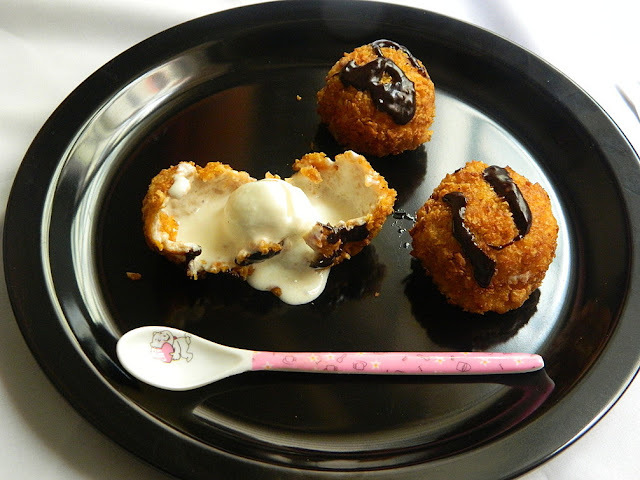 Similar way the other day was searching for such recipes over the internet and came across this fried ice cream recipe. You need not require much ingredients for this. I prepared it and it was a great success! In fact hardly got anything to taste since everything was finished by my son :) Hope you try it and like it. 1. Take 2-3 scoops of ice cream and refrigerate it in the freezer for about 1/2 an hour. 2. Meanwhile crush the biscuits to powder. You can use any biscuits like parle, I used sunfeast biscuits. 3. 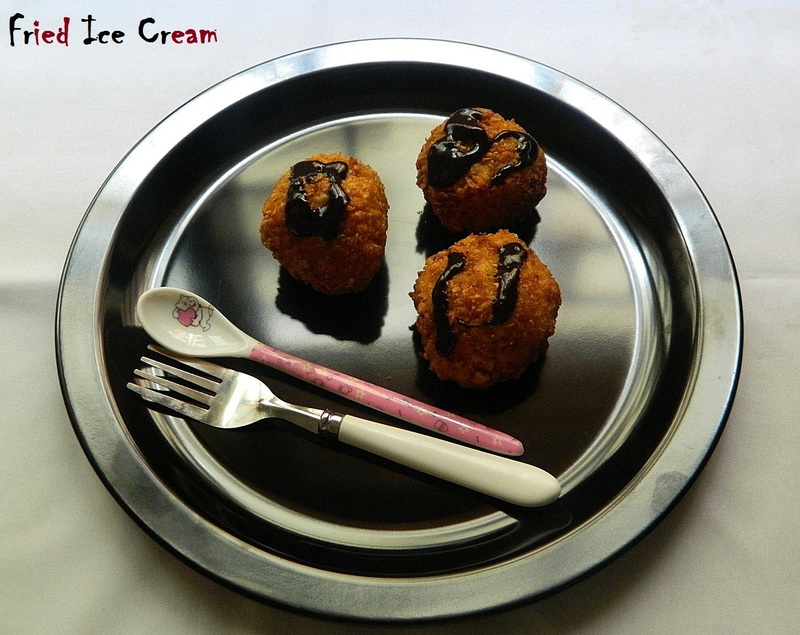 After half an hour when the ice cream is set take it from freezer and roll it over biscuit crush. Roll it on all sides so that its fully covered with the biscuit powder. 4. Keep this again in freezer for half an hour. smooth paste. The paste should not be too thin nor too thick. 6. On the other side crush the corn flakes and spread it on a plate. see to it that cornflakes is sticked on all sides of ice cream scoop. 8. Keep this in freezer for around 3-4 hours untl it gets set. 9. Take out and fry them on a medium flame for 15-20 seconds in hot oil. 10. Garnish this with hot chocolate sauce. Check for the consistency of all purpose flour paste it should not be too thin nor too thick.